I bought my gun used from Duncan’s Gunworks in San Marcos, CA. The pistol was originally purchased by someone for self-defense purposes. After firing the gun at the local range the buyer decided that it was “too much gun” and traded it in for a 9mm pistol. Thus, when I bought it I saved about 200 dollars (at the time, 1997) over the price of the gun new. I owned and shot this gun “as is ” for two years until I met a gunsmith who works at the Oceanside Shooting Academy in northern San Diego County. This fellow gave me some much-needed advice on my shooting style and suggested that some relatively low-cost improvements to my M1991-A1 could improve the gun and my shooting tremendously. The gunsmith installed did a trigger job, bringing the pull down to about 3.5 lbs. A competition trigger was ordered from King’s and installed. A match quality barrel bushing was installed over the original Colt barrel (the gunsmith advised me NOT to change barrels as the Colt barrel is as good as anything out there in his opinion). A full-length guide rod and new (heavier) recoil spring ordered from Wilson Combat. A new set of sights was installed to replace the GI sights. These were white three-dot sights… no illuminated night sights or anything fancy. Lastly a set of Hogue wrap-around grips were put in place. I suggested several other “trick” improvements… new mainspring housing, Meprolight sights, beveled magazine well, competition hammer, extended mag release, ambidextrous safety and beavertail grip safety. My gunsmith advised me not to bother. 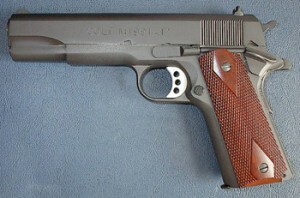 His mission was to make a Colt M1991A1 shoot accurately. His opinion was that if I wanted all those goodies I should spring for a Kimber or Les Baer. Well, the results were a gun that cost me $365.00 to start and with about $250.00 in improvements shoots as well as the guns owned by my friends which include Kimbers, Springfields, Les Baers, Ed Browns and Colts with hundreds of dollars of improvements. This gun shoots the eyes out of the targets and is dependable as hell with every kind of ammo that I’ve fed it. The moral of the story… the “low end” Colt M1991A1 with very little modification can be made to shoot like the race-guns that cost much, much more. I must admit that I am not yet satisfied, however… I am considering having my gun re-Parkerized or perhaps even blued. Why? I don’t know… as the English mountaineer said… “Because it is there”.